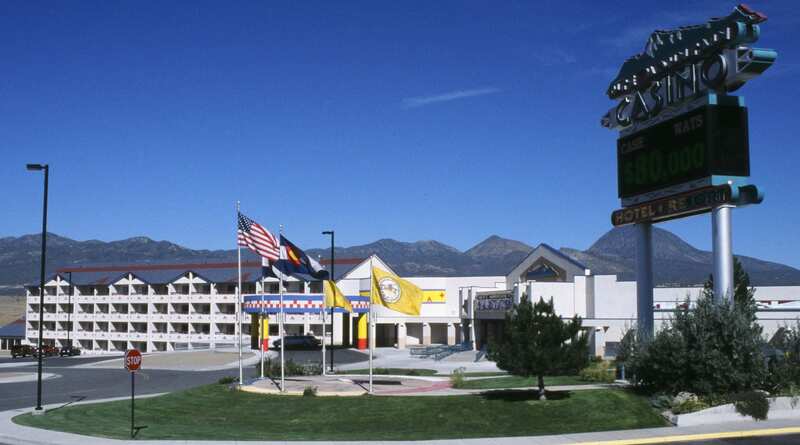 [Sky Ute Casino in Southern Colorado.] Colorado’s Native American casinos are found within the Ute Mountain National Reservation, where the Southern Ute Tribe has lived officially since 1897. It is an area that covers parts of southwest Colorado and neighboring Utah and New Mexico. The highest peak in the Ute Mountains is called the Sleeping Ute Mountain, and is a sacred place for the Ute Tribe. In fact, the mountain range when seen in profile is said to resemble the chief of the Ute tribe lying down with arms folded across his chest. Sleeping Ute Mountain rests behind Ute Mountain Casino. Gambling is the southwest offers fun of Vegas-style gaming two 24/7 casinos. Both have hotels attached so accommodations and modern amenities are on-site. One is located in between/south of Pagosa Springs and Durango, the other casino is south of Cortez. Native reservations have sovereignty laws that mean tribes can bypass state law when it comes to gambling. So these are the only two casinos in Colorado outside of the permitted towns of Central City, Black Hawk and Cripple Creek. Each casino below is authorized and run by members of the Southern Ute Tribe. Gamble responsibility and good luck! Sky Ute Casino in Ignacio, Colo.
First up, Sky Ute Casino, an architecturally striking modern casino, an oasis in the southwest. Offering a full package, it is a resort with hotel, restaurants and casinos all present. There are 140 luxury rooms on offer, as well as pool, spa and salon. 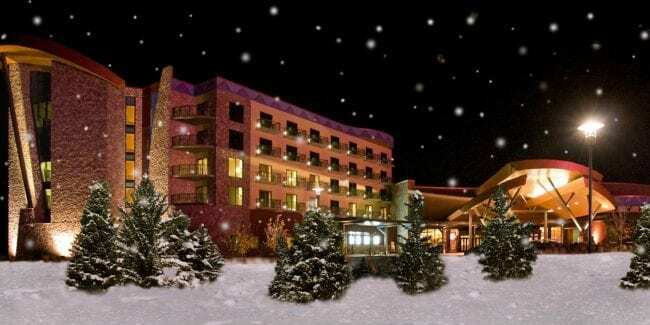 Rooms either have views of the San Juan mountains or the dazzling atrium. As for the casino in Ignacio, it has the whole gamut of Las Vegas style gaming to choose from; and of course there are a huge selection of slot machines available. As you probably already know, slot games have lots of different themes and game types, so you will almost certainly be able to find something to fit your taste. Beyond slots, there are all the table games you would expect, with three card poker, blackjack, roulette and craps available for those who prefer the green felt. All the games are overseen by highly trained and highly skilled croupiers and dealers, so you can expect a slick and fast paced game. Bingo is available for a change of pace and different flavor of gaming. On top of everything Sky Ute Casino offers, enjoy a huge variety of entertainment on site, from live bands to stand up comics. There is also a museum and cultural center, covering the heritage of the Southern Ute Tribe. Learn a little more about the reservation’s past. Ute Mountain Casino in Towaoc, Colo. The Ute Mountain Casino is placed at the foot of the Sleeping Ute Mountain, providing stunning views of the whole range. There is a hotel, entertainment hall and restaurants all built into the complex, so you can sit back relax and enjoy a complete stay. Situated in Towaoc, the hotel offers rooms for all budgets, from the simplicity of a standard room through to luxury suites. All rooms come with free access to the pool, jacuzzi and spa area, as well as quick and convenient access to the casino. The casino offers a huge range of slots, with all the latest games and the chance for huge payouts. If you are looking for the hottest newest slot games, the gaming floor is the place to be. Alternatively, you can try your hand at the table games, with roulette, three card poker and Texas hold ‘em all available. King’s Bounty Blackjack allows you to win up to 500 times your wager! The bingo hall fits in up to 400 people, so you can be guaranteed a fun game and an exciting atmosphere. The friendly staff is and always willing to help out with a game or payout if you don’t understand.